Filippo Musca, Deputy Director of the Siracusa International Institute, attended today the Launching Conference of the Euromed Justice IV (EMJ IV) project in the Hague. The major purpose of the project is to enhance the development of effective and democratic justice systems in Europe and the Mediterranean region that respect human rights, the rule of law and related international principles. 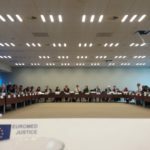 The EuroMed Justice IV project aims also to strengthen international cooperation between the European Union and the South Partner Countries (SPCs) in the areas of civil and criminal justice, and support significant reforms concerning the independence of justice institutions and access to justice in the SPCs. This mechanism of cooperation is supported by Eurojust and the European Judicial Network (EJN), with the cooperation of the United Nations Office on Drugs and Crime (UNODC), the United Nations Counter Terrorism Executive Directorate (UN CTED), the Council of Europe – European Committee on Crime Problems (Coe-CDPC) and the International Associations of Prosecutors (IAP).